Perth is possibly set to receive a new freight link, to connect Fremantle Port with Perth Airport, which will reduce the current driving time by 16 minutes. With the widening of roads, removal of traffic lights and the extension to existing highways, the new link is set to remove 65,000 trucks from local roads per day. 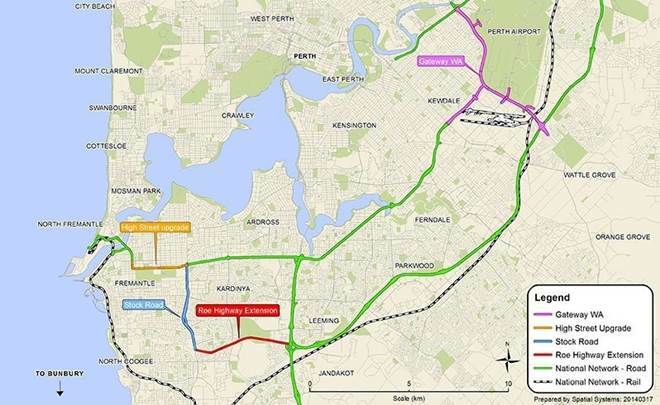 Soon to be approved in the Abbott Government’s first budget, the new Perth freight link is set to cost the Federal Government $925 million, the State Government $230 million and the private sector $445 million. In return for their investment, the private sector has been given the go ahead to toll heavy vehicle users for 25 to 30 years to use the new road link, most probably by using an electronic e-gantry. The main motivator behind the development of the new Perth freight link is to remove heavy vehicles from around the Murdoch area and the soon to open Fiona Stanley Hospital, making it safer and with less traffic congestion. There are still many environmental concerns that need to discussed. For water delivery in bulk and other road transport needs, please call (08) 9410 1726. To find out more about the new Perth freight link, you can read more in the West. Dangerous Goods Transport Regulations To Change in NSW Bio-Crude Oil Could Cut Fuel Emissions By 80% Truck Manufacturers Tackle Fuel Efficiency Longest Road Train in Australia?